FIFA 18 – A bold step? 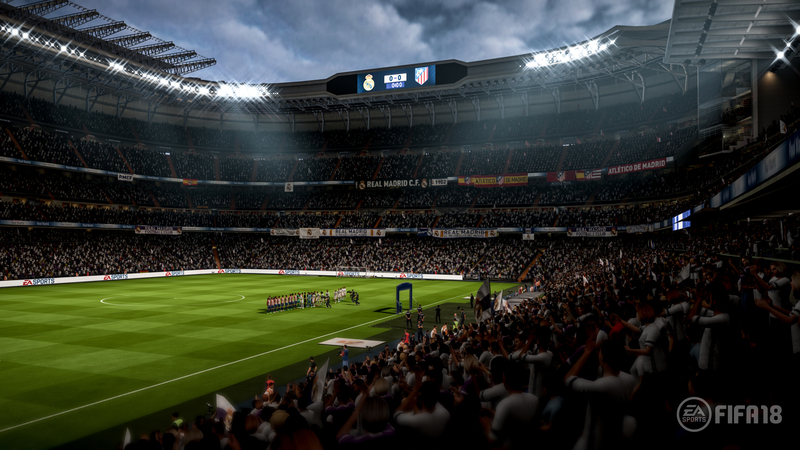 FIFA games have a habit of presenting us with the most accurate representation of today’s footballing world in an accessible format, complete with countless football teams, players, shirts and stadiums. It was the one place where English Premiership and League 2 football fans alike could embark upon a footballing adventure and take their home team or dream team to the top. Or not, if you have my skills. But you had the choice. I’m not the most ardent football fan out there. That’s probably going to become apparent the more I go on. I support or, more accurately, I follow Doncaster Rovers FC. Because that’s where I’m from. And I like to see the national team (England) do well. Which isn’t often, especially when it comes to taking penalties against national teams who’s fans enjoy bratwursts and brass bands. So, every year, I get to take Doncaster Rovers from their current league at the time to the English Premiership, strolling past teams like Manchester United and Chelsea with ease. And occasionally, I’ll venture into online play. And promptly lose. Repeatedly. Mainly because I’m pretty terrible at FIFA, and partly because no one else seems to play with a similar level team, like Barnsley, or Rotherham. Instead they seem to use Barcelona and Arsenal. However, FIFA 18 seems to be closing the gap between amateurs like myself and those of you who live and breathe the game. It’s not by much, but it’s enough to provide a modicum of hope. Because it’s not quite the festival of online trickery that it used to be. And the best example of this is with FIFA Ultimate Team. Graphically, it’s an improvement, not a revolution. Previous to today I had never really fully embraced FIFA’s Ultimate Team feature. Of course, I had played around with it, against both real life and A.I. players. But I never really embraced it before. Where the main game, featuring Alex Hunter, or the regular online options that involve me taking Doncaster Rovers out into the big wide world against other players provide a platform in which to practise your art, Ultimate Team is perhaps the best representation of the footballing world. Everyone, more or less, starts off on an equal footing, unless you like to part with a lot of real money, that is. And from there on you can build up your team and compete against the A.I. or other humans. Of course, I’ll never reach the dizzy heights that the hard-core fans strive for. But I can get a lot further than I can with Doncaster Rovers. Mainly because there’s more of an equal footing, due to the sheer size and complexity of managing a team in FUT, but also because I can sign players who will probably never play for Doncaster Rovers. But they will for me. And there’s the attraction with FUT. I might be labelled as a heretic by others, but I frequently find myself feeling more attached to the players in my bespoke Ultimate Team than I do the Doncaster players. It’s a personal venture, especially when you finally bag that one player you’ve been after for ages, or when you encounter other real human opposition and make a glorious comeback and win. It’s probably the best combination of regular arcade football, and the in-depth management features of Football Manager, but without the intricate minutiae that can often stifle the whole experience. Alex Hunter continues his journey. Of course that’s not to say the rest of the game is the same, because it’s not. You can go on an adventure with the Journey, through the eyes of Alex Hunter, who’s story picks up from FIFA 17. And, surprisingly, things go in a different direction than expected. But it’s understandable why it happens, especially when you factor in EA’s intended market. But The Journey is an interesting diversion for FIFA. More importantly, though, it provides choice. Online and single player is another slice of that choice. Whether it’s a lower league team or the best the world can offer, there’s plenty to do here. And that’s probably always been FIFA’s strength – the ability to choose your preferred gaming option. The gameplay is now much slicker and smoother than before. It’s still not lightning fast, but it’s a definite improvement over previous iterations of the series. But as with all FIFA titles, you’ll still encounter the odd issue, such as players responding unusually slowly just when you need them to move a lot faster. On more than one occasional I’ve had a defender or midfielder simply grind to a halt, allowing the opposition to sail past and score. But there have been definite improvements. One of the most prominent improvements is the ability to quickly substitute players, mid-game, without resorting to the team management menu. The game will offer up suggested substitutions and you can opt to go along or carry on. It’s a welcome addition that I hope sticks around in future iterations of the game. Overall FIFA 18 seems more inclined towards online play and streaming, with a strong community focus. Couple that with the fact that this title seems to cater for a variety of different players, who like different features (reminds me of Halo 3) and its easily a game that caters for all comers. FIFA 18 is a competent title with plenty of features and improvements over previous versions. But yet again these are iterative improvements. There’s nothing revolutionary here, nothing to shout from the rooftops. But that doesn’t mean it isn’t fun. Next Post Deadbeat Heroes – Punching above its weight?